Just be sure that the spot you choose allows your breakfast table to be bathed in soft morning sunlight. Your table display will absolutely glow! Speaking of glow…cast a pastel-colored haze over the entire scene with decor elements in classic ivory, baby pink and mint green. The good news is that all these can be made from easy-to-find materials right in your neighborhood craft store. 1. Think edible decorations – It’s the no-hassle approach to table decorating plus you can get very creative with what to use. 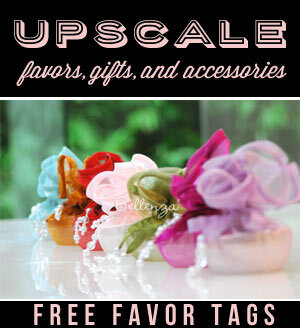 Think of colorful cupcakes, croissants, and éclairs presented on elegant pedestal serving plates. 2. 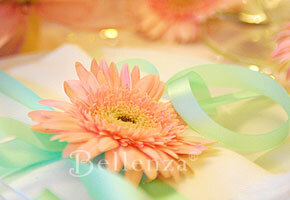 “Plant” faux flowers as floral accents (fresh, of course, is best) – Here, we’ve used pink gerbera daisy heads to adorn the table napkins and smile up from amidst the table decor. 3. Infuse soft candlelight dressed in simple candles – Set textured white candles on mirrored coasters ringed by tiny pearls and crystals. Instant class, style, and sparkle! 4. Use creative serving pieces – More “garden center” than Grecian, terra cotta planters in the shape of urns need just a coat of white paint…and voila! They make lovely serving stands for plates! Hint: You can also use large wine goblets, jars, or cans as pedestal stands! 5. Add touches of color and sparkle – We did say craft store, didn’t we? See how simple satin ribbons in mint green perk up the ivory and pink setting, while a sprinkling of clear sequins adds a magical sparkle to the table. Just like that! 1. 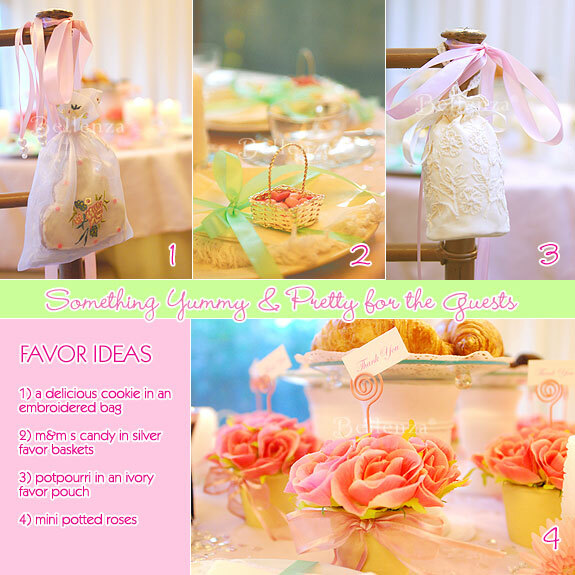 Bake up some cookies in a whimsical shape such as a wedding cake, tuck them into dainty rose pouches, and hang one on each guest’s chair. 2. 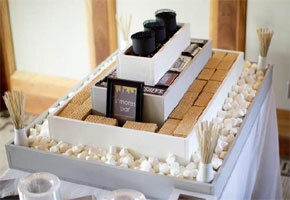 Find your favorite candy and present it in petite silver baskets—one perched atop each place setting. 3. Choose your favorite scent of potpourri and present it in an embroidered ivory sachet, or one handpainted with pretty flowers (view item). 4. Choose favors that serve not just a double, but a triple, purpose—like these mini flower pots of blush pink roses. Their three purposes? 1. For a truly Southern selection, serve up pecan pancakes, country ham, and grits topped with butter. 2. Add Southern French toast, waffles, sausage and egg casseroles, biscuits and gravy, and skillet fried potatoes. 3. If you plan to linger till brunch, be ready with Southern fried chicken and corn bread; plus Paula Deen’s spicy Black Pepper Bacon, Ray’s Sausage, and Oyster Skillet, and her famous Blueberry Coffee Cake and Hash Browns. 4. Finally, what would a bridal shower be without sweet desserts? Offer pastries like lemon chiffon slices, eclairs, red velvet cake, and cream puffs. Yum! I’m a huge fan of the movie “Gone with the Wind” and I plan to have this theme for my sister’s upcoming wedding shower. She’s a real romantic so this would be perfect for her. Thanks for the lovely ideas and those flower pots are so cute. 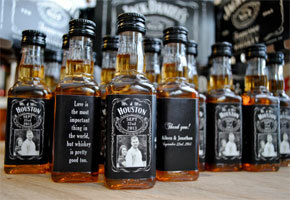 I’d love to have them as the favors. 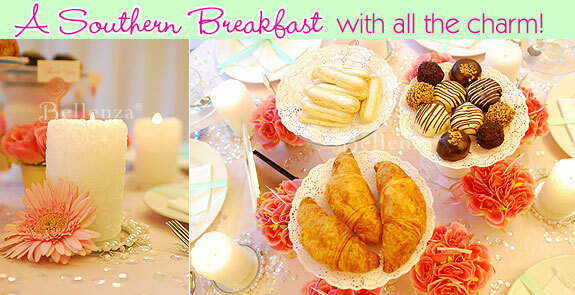 Southern Belle Bridal Shower Breakfast is so simple and yet beautiful. I can’t even begin to thank you so much for this article. I couldn’t find images and words together to showcase what I was looking for and you did it for me. Thank you so much!